Adultery, infidelity, emotional adultery, affairs, cheaters, emotional infidelity or simply cheating in a relationship. In the words of Sam Smith, "I know I'm not the only one". What do you do about it? How do I resolve this conflict? "Why do women cheat?" "Why do men cheat?" Individually, our need for affirmation and attention, how we manage our boundaries, and how capable we are of being loyal to our partner are all relevant. Attention is powerful. We all want to feel wanted, and some people are more vulnerable than others to the advances of someone outside the marriage. Some individuals are better able to make decisions about healthy boundaries (and poor boundaries can lead to situations that are dangerous). And some people just aren't capable of having the empathy or loyalty needed to be true to a partner. In the relationship, having unmet needs can be part of the picture. If we are lacking affection or connection, we can be more vulnerable to situations and personal urges. Situations arise that are simply dangerous. Private conversations that seem harmless... working intimately with someone...having someone else make advances that we aren't prepared for...can all contribute to why an affair happened. I believe that the crazy "connected" world we live in has led to an increase in opportunities to create connections outside our relationships. (see my blog on how social media threatens marriages). I often meet people who either suspect their partner is cheating, or have discovered they are. Let's talk about how to manage those situations. Looking for emotional affair signs? How to catch a cheater? How Can I Tell? Be careful not to make assumptions. You can't know for certain, unless you have evidence. Most typically, affairs leave evidence; they do get discovered if you are paying attention. Gut instincts are often accurate, but there are also many reasons partners pull away or change. Pay attention to your gut, and to your partner's behaviours, but only express what is REAL, and don't make accusations. So it's appropriate to say "I feel less connected to you lately", "It worries me that your phone is never around", "We're making love less and I don't know why", "You used to cuddle up against me at night and you've stopped." Try to stick with what is really happening, and not make accusations based on fears alone. See where that goes. You might get important information about what they're experiencing or need. This can help you fix your relationship, without a fight going bad. If there's been cheating in the past, it's okay to say "when you ___, I get scared that I'm not enough...that it will happen again". What should I do if I my partner cheats? Digging/snooping is both understandable and disrespectful. If you truly believe your partner is cheating (if you've expressed concerns and in return get defensiveness, blame, or denial of a problem), then I wouldn't judge you if you did some digging, but in general...if you want to build trust with your partner... act in a trusting way. I often have clients who rhyme off the fears they have and what supports their fears, then they say "Wait a minute...I truly don't believe this is happening." They want to be helped into a more trusting place. In this case, focus on the evidence that your partner is loyal, and stop snooping. It will feed your mistrust. In this case, don't spy on your spouse! If you Discover an Affair. If you discover your partner is cheating, clearly you both have some decisions to make about what you want. There are no rules; some people can't stay together after a small incident, and some couples can rebuild after a major breach of trust. Seeking a good therapist can help you sort out your reactions and needs, but no one can make this decision for you. If one person leaves before it's talked about, often the other person is left with unresolved emotions and unanswered questions. Again, a therapist can help you make sense of what's happened, even though you may not ever know the full truth. 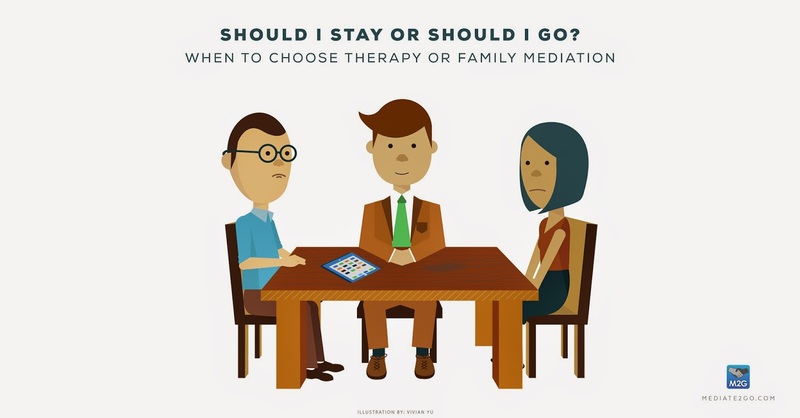 If you decide to leave, then read our blog about when to choose therapy and when to divorce, and then consult a mediator. If you're staying together...know what you need and ask for it. Should I stay or Should I go? How will you move on? Ask. Many people in your position need information about the affair. You might ask yourself, why do men cheat, or why do women cheat? It depends on the person. You deserve to know why, and if the relationship is to be repaired, it's vital for all your questions to be answered. Remember, don't stay in a destructive relationship. Needs. You might need comfort and to be reminded that it's not your fault. It's easy to be angry, but expressing your vulnerable needs to someone who just hurt you isn't easy but it can help the healing process, if they can respond with care. Also, your partner isn't your only source of support. Spend time with people who love you. Express Respectfully. You certainly will need to express all kinds of emotions, and your partner can be expected to hear and tolerate those emotions if they're expressed safely. Belittling, verbal abuse or relentless punishing won't help you rebuild trust and will cement resentment. Don't let conflict escalate, as it will just make things more complicated. Request Transparency. You will likely benefit from greater transparency. If you're not already, sharing email, phone and social media passwords is a strong gesture of openness that builds trust. Don't Avoid. Affairs that aren't addressed quickly create cavities of despair and mistrust in the life of a marriage. Burying it in the sand and not addressing it is dangerous. If you have trouble talking about it, seeing a qualified therapist can help start the conversation. "I cheated on my husband." "I cheated on my wife." You need to be honest with yourself and your partner. Maybe it was impulse, or it happened over a long period. You might feel a great deal of guilt. Seek the help of a trained therapist to know what to do next.